Camfrog Video Chat for Mac allows you to join real streaming video chat rooms where you can hear, see & chat with many people at a time. Instant message a user to get to know them before you Webcam chat, and add them to your contact list. Camfrog Video Chat for Mac works behind most firewalls and routers. Camfrog Video Chat allows multi-user videoconferencing where you can join a room with up to 1000 users and just click a user name to beginer. ...... Press the 'talk' button to talk to the entire room with audio. Camfrog Video Chat for Mac are hosted by broadband users who are running the Camfrog Video Chat Room Server software so any user can set up their own multi-user video conference for other users to join. No Webcam is required to see people, but some rooms might not allow users without Webcams. Camfrog Video Chat for Mac is optimized for broadband users so it has fast video. Camfrog Video Chat for Mac features Large high-quality video support for chat rooms and one on one video chat, features a webcam organizer for Pro users. * Video chat 1-on-1 and join video chat rooms. * No webcam is required to see people. * Camfrog works behind all firewalls, routers, and wireless networks. * It's easy to find new people to video chat with our user directory. Qweas is providing links to Camfrog Video Chat for Mac 6.2 as a courtesy, and makes no representations regarding Camfrog Video Chat for Mac or any other applications or any information related thereto. Any questions, complaints or claims regarding this application Camfrog Video Chat for Mac 6.2 must be directed to the appropriate software vendor. 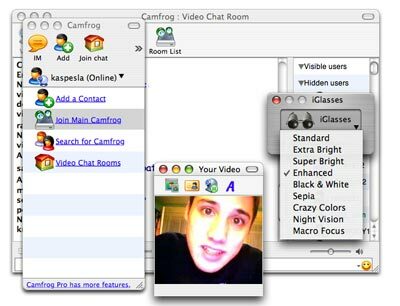 You may click the publisher link of Camfrog Video Chat for Mac on the top of this page to get more details about the vendor.